Light red heat detections were acquired around 12:30 pm; dark red heat detections around 2:30 pm. Far from stalling, the fire along Cienega Camp ran to the top of the ridge today. It is now overlooking, if not in, the Tassajara Creek drainage. And what is this? 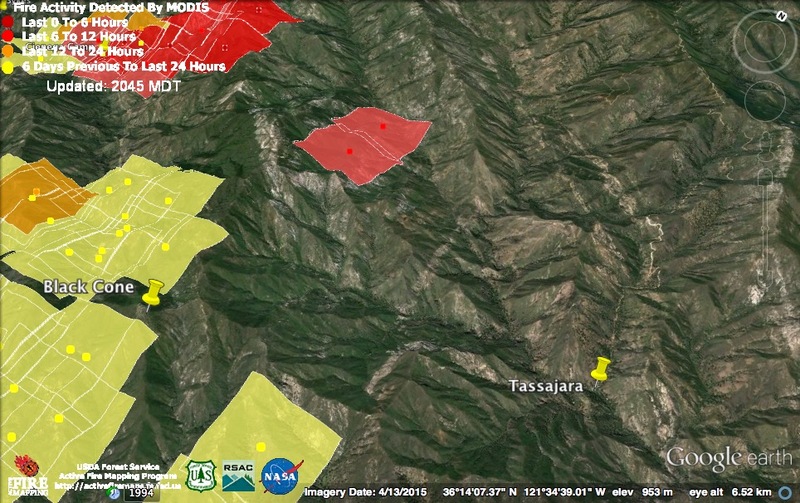 The 12:30 pm satellite located a couple of heat detections well within the Tassajara Creek watershed. Given the major uphill run on the other side of the ridge, a spot fire in this area is quite possible. The good news is that the 2:30 pm satellite did not find additional heat here. Meanwhile, at the south end of the fire, the satellites also found active burning. There now appears to be fire burning along the north bank of Lost Valley Creek from below the Zig Zag Creek confluence almost all the way up to the Higgins Creek confluence. 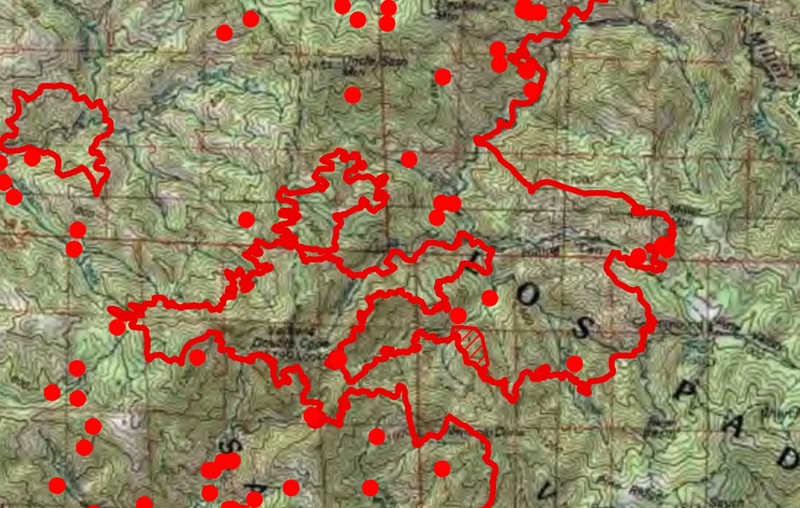 It is even possible that fire may have crossed Lost Valley Creek today. 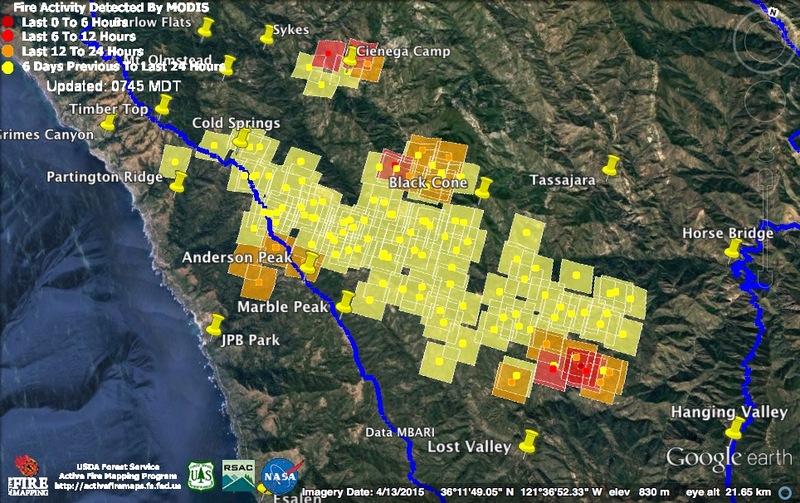 While the fire was obviously more active than expected today, it is notable that the satellites found no new heat around the headwaters of the North Fork Big Sur River or in the Willow Creek watershed. 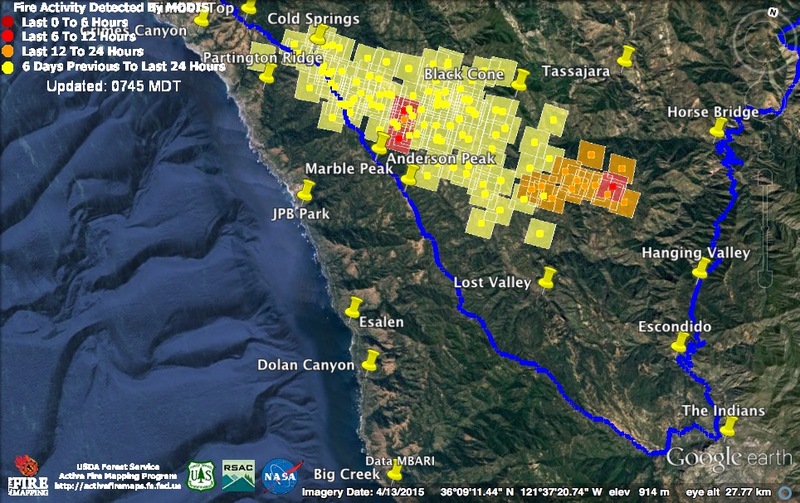 The 11:00 pm satellite found fire actively moving up both sides of Cienega Creek toward Pine Ridge and South Ventana Cone, as well as on the ridge between the forks of the Big Sur River, and overlooking Lost Valley Creek. 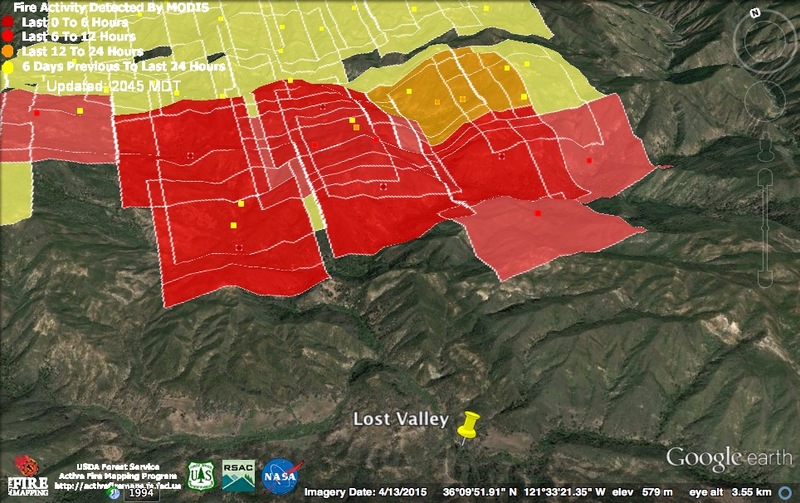 The 3:30 am satellite found heat only at the south (Lost Valley Creek) end of the fire. No new heat was detected overnight from the firing operations along the Coast Ridge. 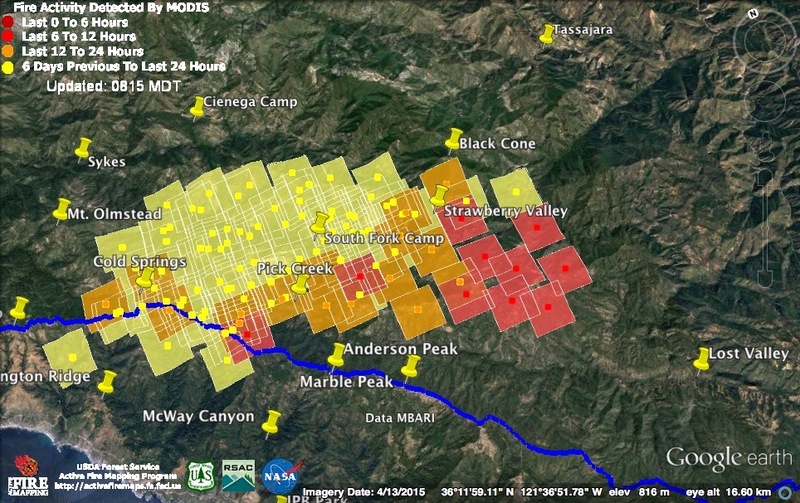 If you’re looking closely at the map, though, you may be wondering about the two new orange heat detections west of the fire line in McWay Canyon. They are a bit of a mystery. They are listed as having been acquired at 1:30 pm yesterday, but were not initially included in the data file with the other heat detections from that satellite pass (which is why they aren’t on my last map). Digging deeper, I notice that they are listed as having a “confidence” value of zero. The heat detections next to them (right along the fire line), by comparison, have a confidence of 100. Just like the MODIS system itself, my confidence in the accuracy of those detections is zero. If there had been widespread fire in McWay Canyon yesterday afternoon we would have heard about it. This morning’s infrared map, based on data acquired around 11:00 pm last night, finds a huge reduction in hot spots over the northern end of fire. 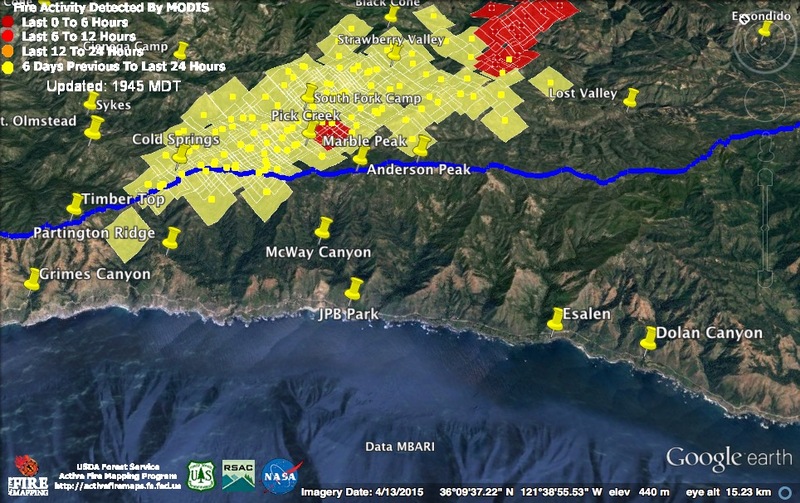 It indicates that the fire along the North Fork of the Big Sur River has made a fresh run to the ridge overlooking Tassajara Creek and that the firing operations on the Coast Ridge have reached Anderson Peak. The map puts the size of the fire at 102, 499 acres. Today is forecast to be cooler and damper than yesterday in the fire area and the Forest Service predicts that the spread of fire along Cienega Creek may stall out as a result. Light south winds, together with yesterday’s firing operation, should greatly reduce the threat to the Coast Ridge fire line. Satellite passes around noon and 1:30 pm this afternoon found active fire in four separate areas. The new flare-up, near Cienega Camp, appeared to be moving uphill toward the Black Cone Trail. The fire in the headwaters of the North Fork Big Sur River appeared to be expanding and moving north on both sides of the stream. The southern fire front appeared to be actively advancing toward Lost Valley Creek; and renewed firing operations were creating heat along the Coast Ridge line north of Anderson Peak. There were no new heat detections in the Willow Creek drainage, but the Forest Service warns that the fire is expected to continue moving above Willow Creek and that “rapid upslope runs” remain possible in the Willow and Camp Creek area. They also warn that the fire in Indian Valley (at the headwaters of Higgins Creek) will continue to threaten the Coast Ridge fire line. The marine layer is expected to thicken tonight and tomorrow and this, combined with an onshore flow, should help suppress active burning. The hotter, drier weather has been bringing smoldering coals back to life throughout the burn zone. Infrared mapping, based on data collected around 10:00 pm last night, found isolated pockets of heat in places where fire hasn’t been seen in quite a while. These include Mal Paso Canyon, Palo Corona, the Mitteldorf Preserve, Joshua Canyon, and on the hills above Rancho San Carlos. These are all well within containment lines and, with most fuel around them already burned, unlikely to spread. 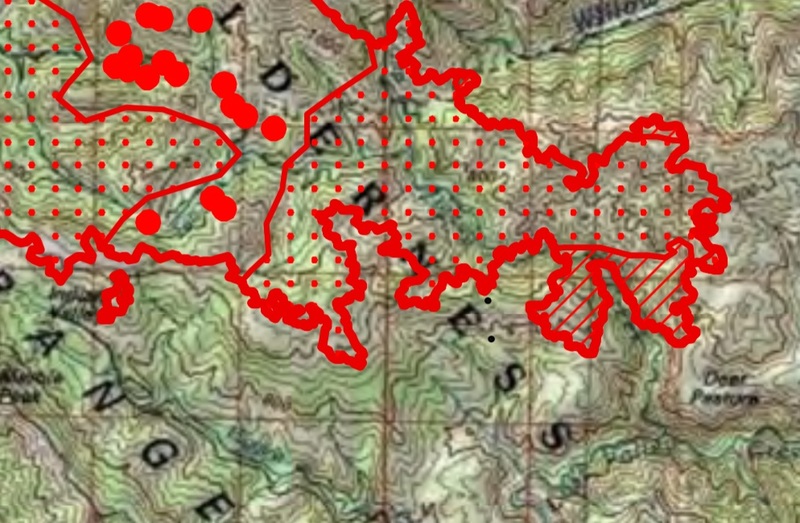 A concentration of heat detections around the divide between Hiding Canyon and Pine Valley suggests that renewed fire activity in this area is possible. 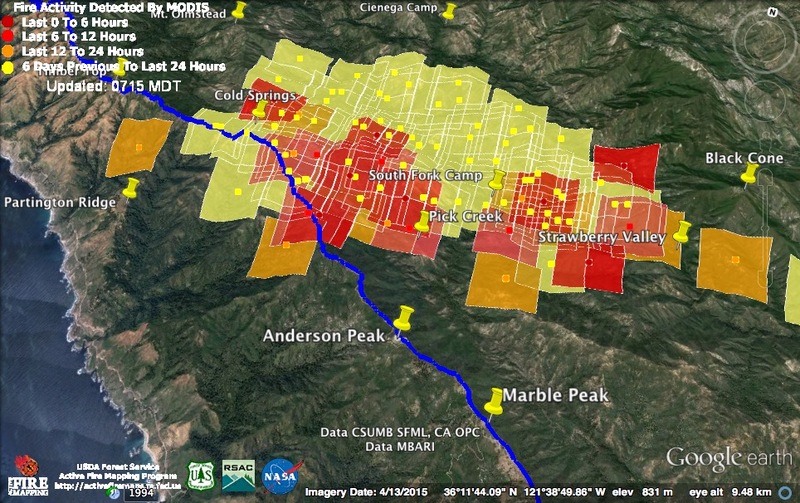 An zone of intense heat was also detected between Ventana Cone and the Carmel River. 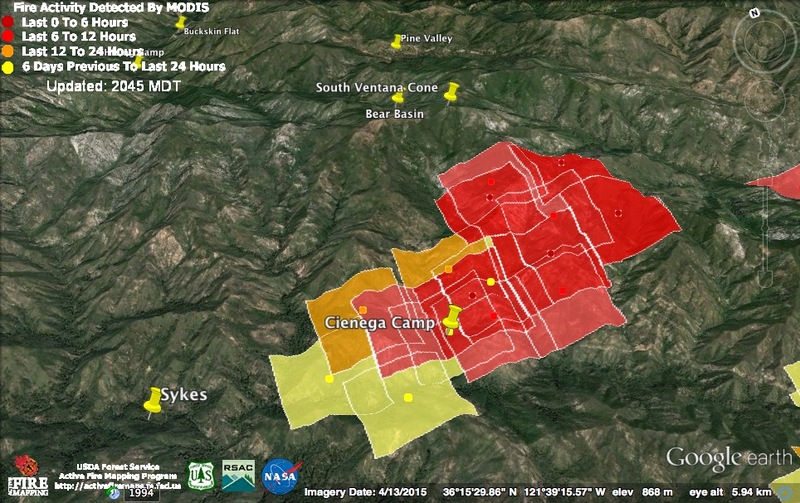 Further south, the infrared map confirms active burning in the Cienega Camp area. Note that there is also an area of active burning further up toward the headwaters of the North Fork Big Sur River (lower right corner). That flare up, on the North Fork, is the only place the satellites found heat last night. The red heat detections on the left and right were acquired about the same time as the infrared data (10:00 pm last night). The heat detection in the middle is from around 2:30 am this morning. Clearly, this fire has the potential to run to the top of the ridge separating the North Fork from Tassajara Creek. 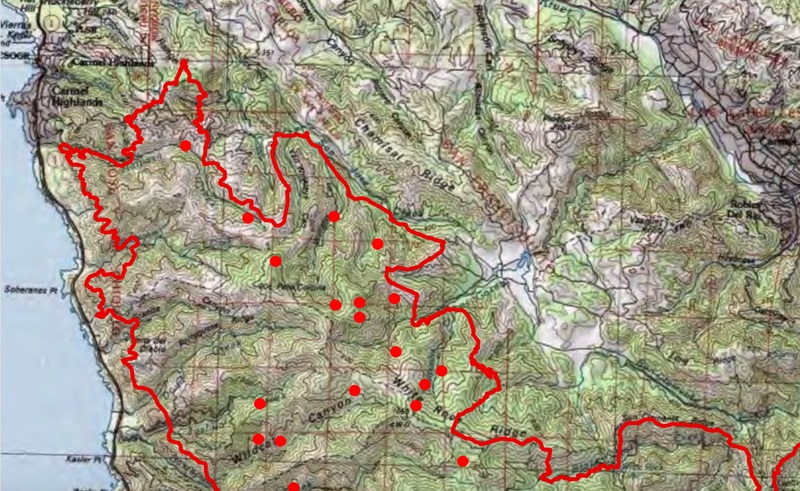 This would, once again, create a danger of fire getting established in the Tassajara watershed. Meanwhile, at the head of the fire, the infrared scan found very active fire working down both sides of Zig Zag Creek toward Lost Valley Creek, and a smaller active fire zone working north toward Willow Creek. Winds over the fire have shifted to southwest this morning. This should bring cooler, damper sea air over the fire area, but may also push the fire in the direction of Tassajara. Fortunately, the winds are light. Click here to view this morning’s complete infrared map. This morning’s official numbers: 101,490 acres; 60% contained; 57 homes destroyed; 11 outbuildings destroyed; 1 fatality; 6 injuries. Today’s lower humidity and higher temperatures hadn’t led to any major new runs as of early this afternoon (satellite passes were around 11:00 am and 2:30 pm today), but they had brought the long-moribund fire front near Cienega Creek back to life. Fire was burning around Cienega Camp and along the North Fork of the Big Sur River downstream of the Cienega confluence. The fire that ran east toward the Arroyo Seco River yesterday was backing north toward Willow Creek and south toward Lost Valley Creek. There was no sign of active fire near the Coast Ridge fire lines. A light south wind was supposed to develop early tomorrow, bringing cooler, damper sea air over the fire, but recent forecasts seem to have called this off. The latest word is that tomorrow will be even hotter and drier than today – with cooler weather not arriving until Thursday. The Chimney Fire, on the other hand, was declared 100% contained today. The fire cooled off again overnight, but with warmer and drier conditions forecast for today, it should soon become active again. The red heat detections were acquired around 11:00 pm last night. The early morning satellite apparently found no heat. 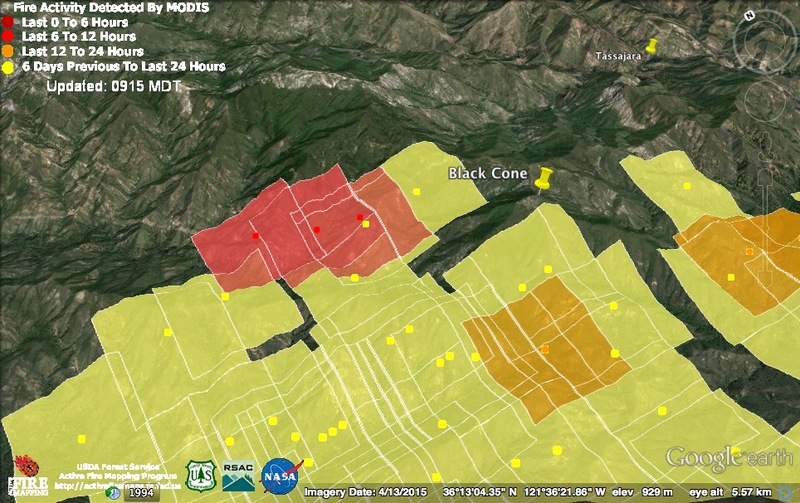 The most active burning at 11:00pm was in the Pick Creek area, just northeast of Anderson Peak. This map shows the current position of the fire in relation to the containment lines where firefighters hope to eventually stop it. This means challenges to the Coast Ridge fire line are possible today from north of Anderson Peak, down to Marble Peak, or beyond. 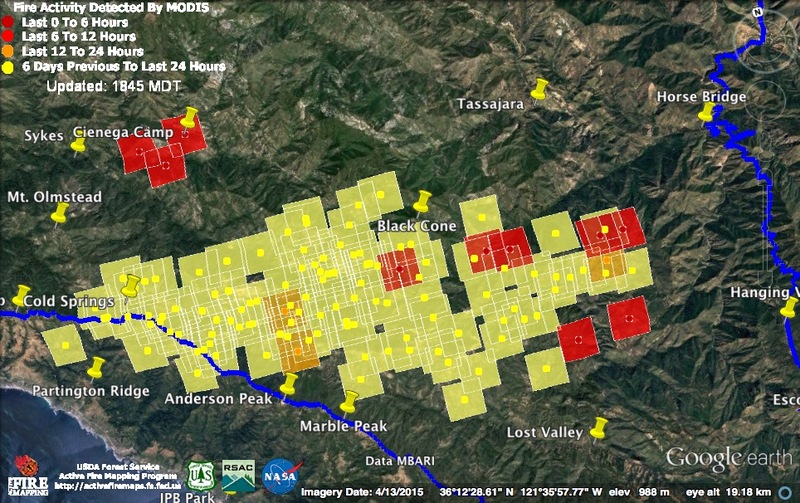 “Upslope spread” in the North Fork area, would likely put active fire above Tassajara Creek again, as could an uphill run in Camp Creek (which is near Black Cone). The ridges above Tassajara Creek have been painted with retardant and that has, so far, prevented fire from establishing itself in the Tassajara drainage. Click here to view this morning’s infrared map. This morning’s official numbers: 100,979 acres; 60% contained; 57 homes destroyed; 11 outbuildings destroyed; 1 fatality; 6 injuries. The fire made another big push to the east today. This time through the high, dry and extremely remote (not so much as a trail) country between Willow and Lost Valley Creeks. In the direction it is going, it will soon run out of high country and have to back down toward the creeks or the Arroyo Seco River, if it wants to progress any further. The Arroyo Seco River runs between Lost Valley and Hanging Valley and on down to Horse Bridge. The eastern containment line, which I haven’t yet added to the map, runs through Hanging Valley and just to the right of Horse Bridge. These heat detections were acquired around noon and 2:00 pm today. No heat was found near the western line, on the Coast Ridge, at that time. Fire activity has likely picked up closer to the Coast Ridge fire line since then, though, because at 6:00 this evening the evacuation warning area (note that this is a WARNING, not an order) on the Big Sur Coast was expanded to the south. The evacuation warning area now includes everything east of the Highway from Grimes Canyon to Dolan Canyon, including Dolan Ridge Rd. The Forest Service says the expanded warning area is needed “due to warmer, drier weather that has increased fire activity on the east side of North Coast Ridge Road.” It’s refreshing to have a clear explanation rather than rumors of failed lines, etc. 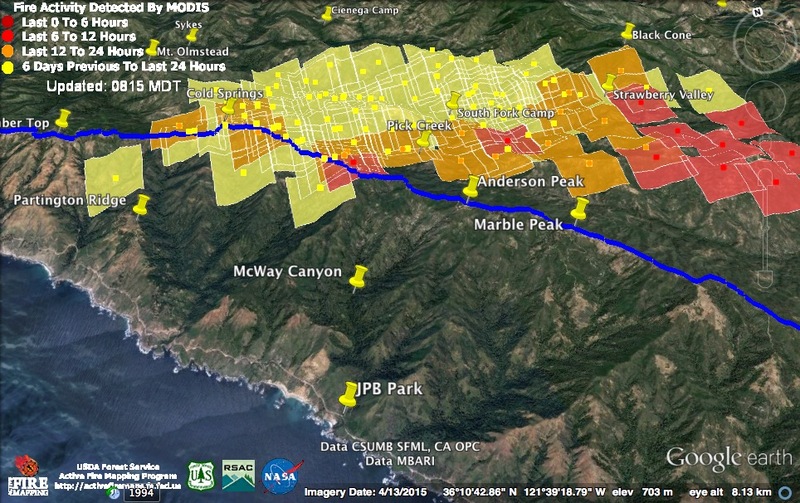 This map depicts the Grimes Canyon to Dolan Canyon evacuation warning area, together with the Coast Ridge fire line (in blue). The Forest Service also says a drone was reported over the fire yesterday. While I doubt anyone stupid enough to interfere with firefighting operations by flying a drone is reading this – if you know anyone that stupid, please advise them knock it the (expletive of your choice) off. This evening’s official numbers for the Soberanes Fire: 100,428 acres; 60% contained (for the 25th straight day); 57 homes destroyed; 11 outbuildings destroyed; 1 fatality; 6 injuries. The MODIS satellites did not find any heat on the fire overnight. They did not, in fact, find any heat over nearly the entire State of California, which is pretty unusual. Some kind of error has probably occurred. That leaves this morning’s infrared map, based on data acquired a little before 9:00 pm last night, the most up-to-date source of information. It contains no surprises. 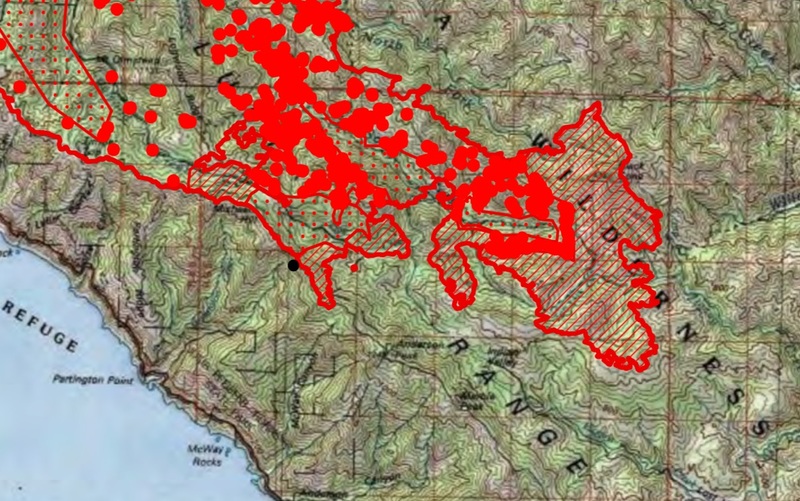 The map shows active fire on both sides of Pick Creek and advancing south up Bathtub Creek beneath Anderson Peak, a large active fire zone in the headwaters of the South Fork Big Sur River that slops over the hill into the headwaters of Higgins Creek (with, apparently, a spot fire ahead of the main front near Indian Valley), a smaller active fire zone in the headwaters of the North Fork Big Sur River, and a very large active fire zone centered on Zig Zag Creek, but reaching over the divide into the headwaters of Willow Creek. Those worried about Tassajara will be glad to see that the section of fire perimeter overlooking Tassajara Creek shows only a few isolated heat detections. The Forest Service appears to believe the real danger to Tassajara will come from fire moving north out of Willow Creek. There has been no official update as yet this morning, but the infrared map puts the fire’s size at 100,428 acres. Another day of active afternoon burning. 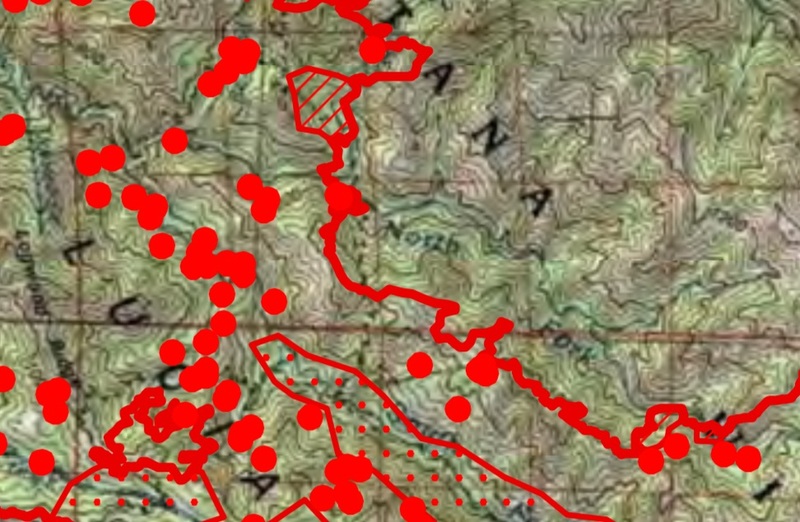 The 11:30 am satellite found heat (light red squares) mostly within the existing fire perimeter, but the 3:00 pm satellite (dark red squares) found fire expanding to the north, south and east. To the north, fire appears to be moving up the central spine of the Santa Lucia Mountains above Black Cone. To the east a long fire front appears to stretch from the Ridge between Tassajara and Willow Creeks, south across the headwaters of Willow Creek and further south nearly to Lost Valley Creek. On the fire’s southern front, flames appear to be backing into Higgins Creek. This is a concern because, if fire crosses Higgins Creek, it could easily make a hard uphill run at the Coast Ridge fire line. The Forest Service finally issued an update around 11:00 am this morning. They report that the slop over in the McWay drainage no longer poses a threat to containment lines (which, I guess, means it’s been contained). If you’re wondering whether the update was delayed until this good news could be reported, you’re not alone. 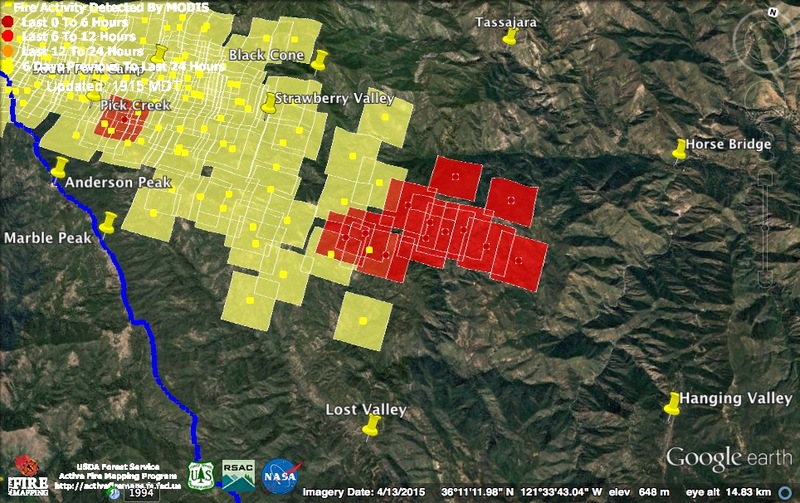 They also state that the “eastern edge of the active fire is now approximately 2.5 miles from the Tassajara Zen Center, but separated by several ridgelines.” This statement makes no sense. 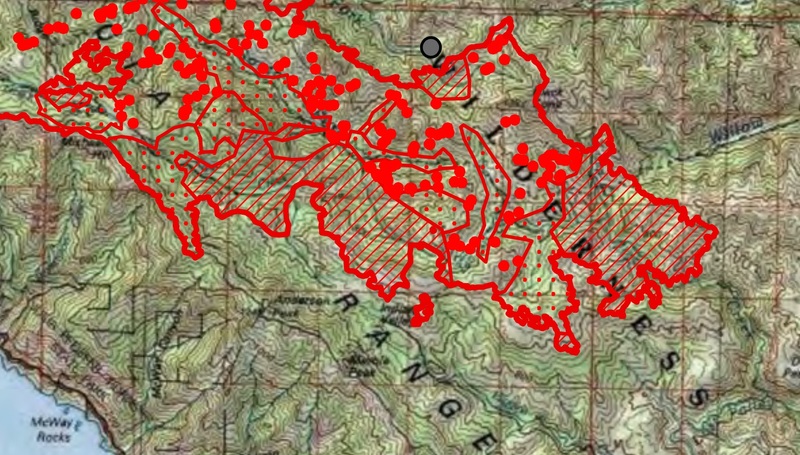 Since the fire is now on the edge (at least) of the Tassajara Creek watershed, there are clearly no “ridgelines” between the fire and the Zen Center. As of 3:00 pm this afternoon, anyway, the Zen Center did not appear to be in any immediate danger. The update also states that no firing operations were planned for today. This evening’s official numbers for the Soberanes Fire: 98,420 acres; 60% contained (for the 24th straight day); 57 homes destroyed; 11 outbuildings destroyed; 1 fatality; 6 injuries. As it appeared from the smoke, the big run to the southeast, between Zig Zag and Higgins Creeks, only grew more intense during the late afternoon and early evening yesterday. The red heat detections were acquired around 11:30 pm last night. There are no heat detections from the early morning hours, so either there was a huge drop in fire activity after midnight or the satellite was malfunctioning. Of more concern than the big run to the southeast is the single heat detection next to the line at the top of Michael Ridge. Fire could be seen west of the line, and apparently moving into the McWay drainage (it is McWay Creek that goes over the famous waterfall), in this area by about 8:00 pm last night. By 5:00 am this morning, the CHP and others were also reporting fire in the McWay drainage. Hopefully, a thick marine layer will aid firefighters in bringing this slop over to a halt today. Official and semi-official sources differ on whether any firing operations took place yesterday. Some have claimed that all the smoke seen yesterday was the result of firing (clearly not the case), and others that firing operations were cancelled due to winds and increased fire activity (much more plausible). In any case, there has been no official update from the Forest Service in 23 hours now. Funny how official information always seems to dry up whenever something less than perfect is happening on the fire line. This morning’s infrared map, based on data acquired around 10:00 pm last night, shows fire beginning to bleed over the line above McWay Canyon. It also confirms that fire has made it to the summit of Black Cone and is now beginning what will hopefully be a very slow process of backing down to Tassajara Creek. No one with a view of the Santa Lucia Mountains needs to be told that something is burning out there this afternoon. A very large column has been visible from pretty much anywhere that the view isn’t obstructed by fog. This is why. The fire appears to be making a hard run to the southeast across the high country between Higgins Creek and Zig Zag Creek. There is also active burning along the section of line, from Cold Springs to above the South Fork of Partington Creek, where firing operations have recently been underway. 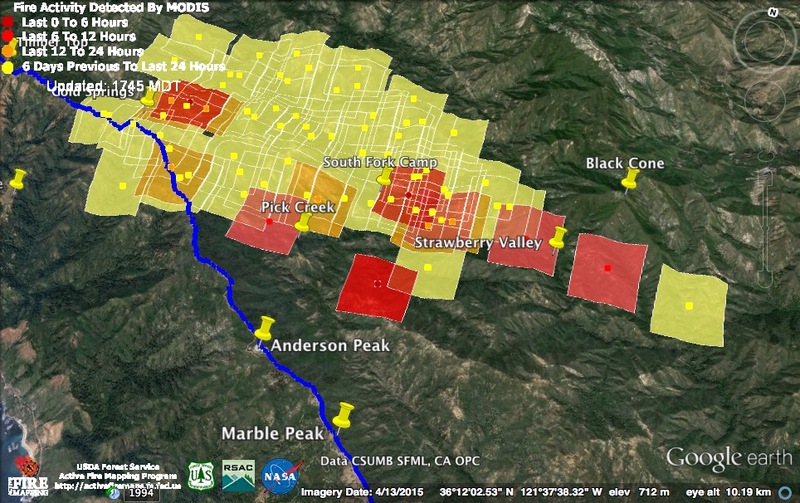 Finally, there is a heat detection east of Strawberry Valley that suggests the fire may be starting to climb Black Cone. Tassajara Creek and the Tassajara Zen Center lie on the other side. This run got underway sometime between the 12:30 pm satellite pass (one or two dark red heat detections inside the previous fire perimeter) and the 2:00 pm pass (all the rest of the dark red heat detections). From the size of the column, it appears to have only gotten more intense since. The light red heat detections are from 3:00 am this morning and appeared as dark red detections on this morning’s map. This new run is not directly threatening the unfired line around Anderson and Marble Peaks (yet), but it will definitely make firing that line more urgent. A flare up has also been reported this afternoon on the north end of the fire, in or near the Mitteldorf Preserve. This is likely behind the fully contained fire perimeter in that area and unlikely to spread. This evening’s official numbers for the Soberanes Fire: 95,716 acres; 60% contained; 57 homes destroyed; 11 outbuildings destroyed; 1 fatality; 5 injuries. The fire stayed more active overnight than it had in several days. Afternoon firing operations appear to have brought the fire a little further down the Coast Ridge and there was a lot of heat concentrated in the headwaters of Pick Creek. 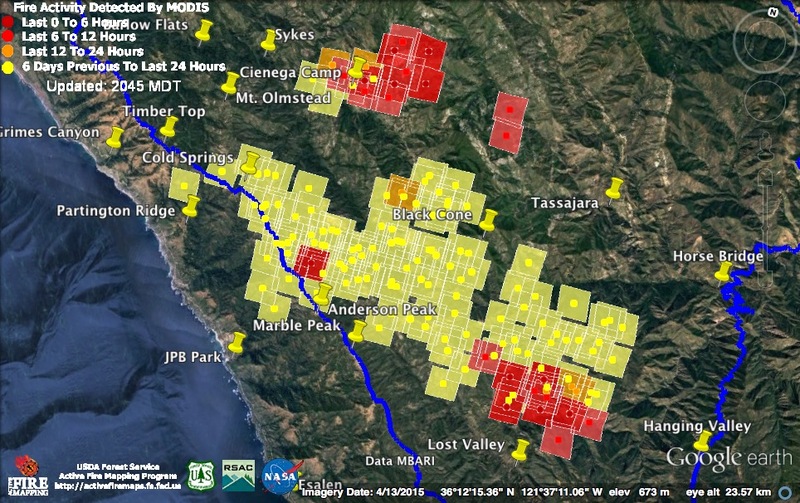 The fire also appeared to be expanding north across the headwaters of the North Fork Big Sur River and further east in the headwaters of the South Fork. The official numbers for the Soberanes Fire have not yet been updated this morning. Containment on the Chimney Fire is up to 97%. 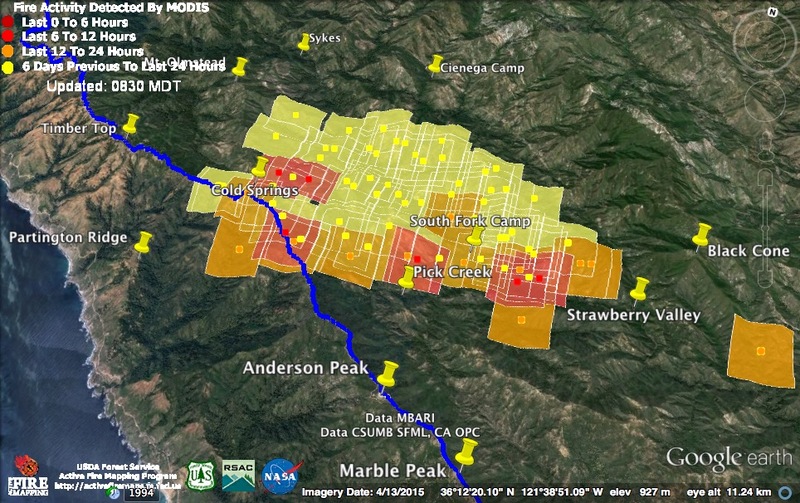 Today’s heat detections suggest that the fire has moved east into the Zig Zag Creek drainage, likely burning through the Strawberry Valley area and expanding further east along the route of the Marble Peak Trail. 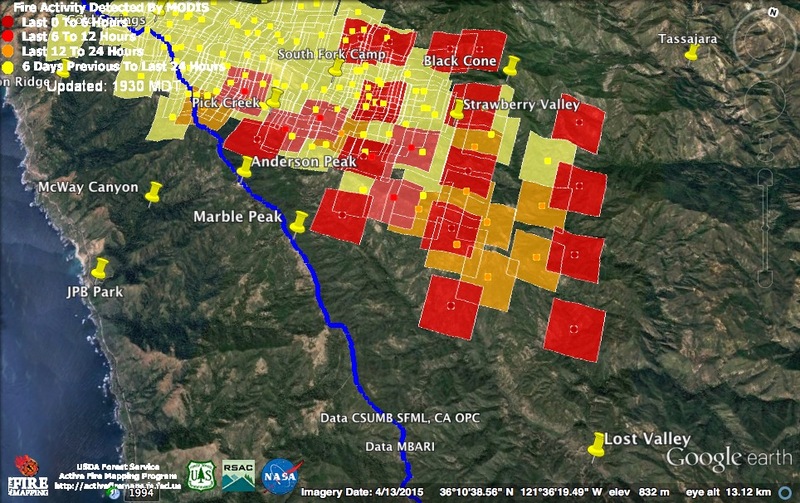 There also appears to have been expansion to the south in the Pick Creek drainage and in the headwaters of the South Fork Big Sur River. The light red heat detections were acquired around 11:30 am; the dark red detections around 2:00 pm. Since then, the amount of smoke rising from the fire has greatly increased, so it is likely that further expansion has taken place. At noon today the Forest Service announced a plan to begin a “low intensity strategic firing operation” near Los Padres Reservoir at approximately 1:00 pm. I don’t know how that’s going, but it wasn’t picked up by the 2:00 pm satellite. This evening’s official numbers for the Soberanes Fire: 94,736 acres; 60% contained; 57 homes destroyed; 11 outbuildings destroyed; 1 fatality; 5 injuries. The Chimney Fire is now 95% contained. In other news, the entire Monterey Ranger District of the Los Padres National Forest has now been closed. That means the Ventana and Silver Peak Wilderness Areas plus all surrounding National Forest lands. The only exceptions are a few front-country campgrounds. Fire activity decreased again overnight. 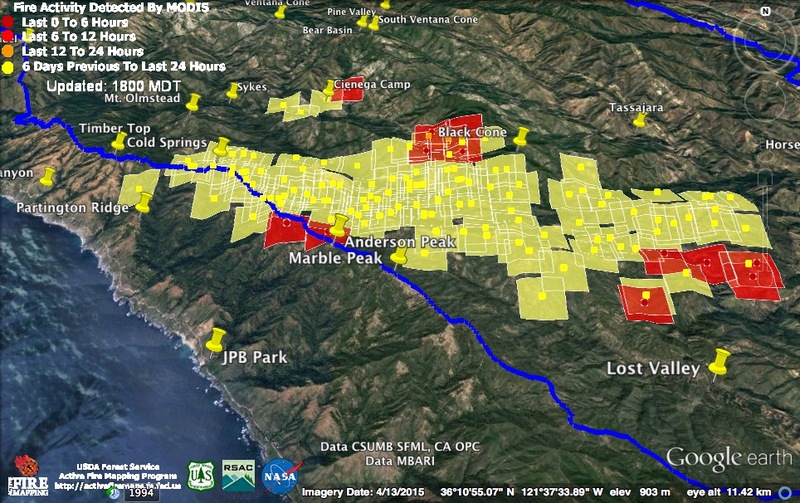 A satellite pass just after midnight found heat from firing operations near the line south of Cold Springs, as well as at the south end of Logwood Ridge, on the north bank of Pick Creek, and along the South Fork of the Big Sur River. Today should be a little drier and warmer than yesterday, so renewed fire activity is probable, but the coming weekend is expected to be cooler and damper (although possibly a bit windier), so the fire’s progress will likely continue to be slow. There has been no significant fire activity or forward progress of burning along the fire perimeter from Los Padres Dam all the way to the North Fork Big Sur River in over a week. Other than on the southern fringe, near the Coast Ridge, helicopter bucket drops, combined with cooperative weather, have essentially brought the fire to a halt. Hotter and drier conditions, along with a little wind, could change that situation dramatically, but what if the weather continues to aid in suppressing the fire? Firefighters traditionally like a fire to burn to well-defined lines, so they can be sure an unjumpable zone of dead-out fire surrounds any remaining interior hot spots. This doesn’t always work out. Sometimes burning conditions are so bad that firing operations won’t take and the main fire goes out on its own before it reaches the lines. This happened on the Kirk Complex Fire, ignited by multiple lightening strikes on September 8, 1999. It burned fiercely at first, and many of the same “Big Box” fire lines were opened that are waiting for the Soberanes Fire now. As the weeks went by, though, the weather got damper and the fire began grinding to a halt. From my place in Cachagua, I watched day after day that October as helitorches flew back and forth napalming the brush in an unsuccessful effort to keep it burning. Finally, the rains arrived and they had to give it up. The fire never reached the Big Box lines in many areas. The Kirk Complex Fire had to be left without a clean, certified dead out, perimeter. This left a risk that a flare up could occur, even months later, somewhere on the edge of the burned area requiring the remobilization of a large firefighting effort. Not a desirable situation from the point of view of the Forest Service, but one they had to live with. It is clearly possible that a similar situation may develop here, especially since the Forest Service seems less intent on forcing the fire to burn out to the lines this time. The official numbers for the Soberanes Fire remain: 94,180 acres; 60% contained; 57 homes destroyed; 11 outbuildings destroyed; 1 fatality; 4 injuries. The official numbers for the Chimney Fire remain: 46,344 acres; 93% contained; 49 residences destroyed; 21 other structures destroyed; 8 structures damaged; 1 injury. This entry was posted on Friday, September 2nd, 2016 at 8:28 am and is filed under Big Sur, Carmel River, Fire, Flood & Apocalypse, History, Santa Lucias. You can follow any responses to this entry through the RSS 2.0 feed. You can leave a response, or trackback from your own site. Anyone know the capacity of the helicopter scoop bucket for water from Los Padres Dam? Total water taken is only a few acre feet, I was told, so it has had no noticeable impact on water supplies. Still, I am curious. The big Air Crane helicopters that pump water into a tank with a snorkel hold about 2,600 gallons. The helicopters that use buckets carry a lot less. I think the maximum size bucket is about 700 gallons. In other words, it would take about 125 Air Crane drops, or about 465 Type 1 helicopter drops to add up to an acre foot of water. Thank you so very much for your consistent and accurate reporting. As of 817 am, I see no helicopters over McWay. I hope that means the slop over is under control. Scanner traffic pretty quiet. “Current Situation: An increase in winds late in the afternoon and evening resulted in a significant increase in fire activity. The overall acreage increased by approximately 2,700 acres, most of which was to the southeast. The fire moved roughly 1. 8 miles and has now passed the Marble [Peak] Trail and Black Cone Mountain. 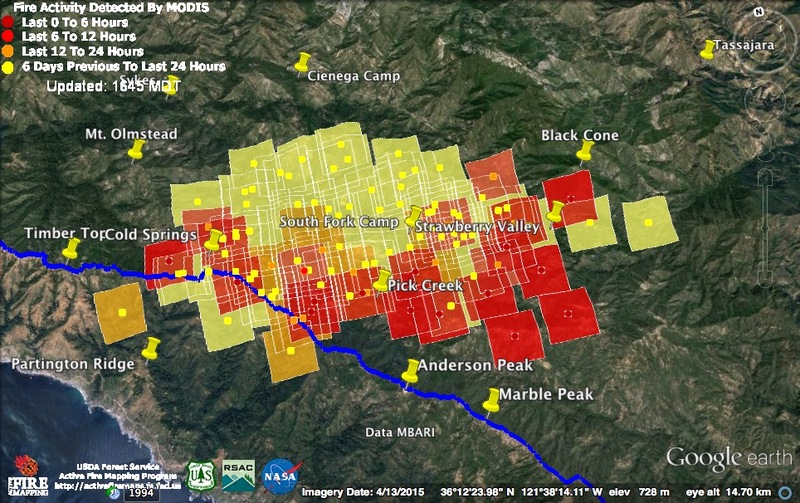 Late Saturday night, satellite heat detections prompted concern for public safety and a possible evacuation for the Tassajara Zen Center. Actual fire spread was evaluated. This resulted in a decision not to issue an evacuation warning. While satellite imagery is a useful tool, it can sometimes be misleading, as radiant heat, gases and smoke can result in a heat image that is not actual fire. The eastern edge of the active fire is now approximately 2.5 miles from the Tassajara Zen Center, but separated by several ridgelines. Firefighters were able to contain two spot fires and a place where fire crept across the containment line along Coast Ridge Rd., 1 mile north of Anderson Peak. Managers say those fires no longer pose a threat to containment lines. Interestingly, VIIRS satellite data that became available early yesterday evening showed heat detections across a west-to-east swath from Black Cone to the Tony Trail, but this was not borne out by the subsequent IR flight nor by subsequent MODIS data. How many acres do they want this to burn, before they put it out? Just returned from the end of the Coast Ridge Rd. I would say that the observations from folks that have not seen the area are not quite accurate. The fire is making progress on it’s own, but USFS folks have both gotten to slop overs and been able to direct it given the weather challenges you and I know exist up there. It it a perfect answe no, but if someone wants answers then one should start at the beginning on July 22nd, not Sept 5. Fire folks are doing their best to lessen an impactful situation. Elected officials deserve the heat for not putting resources in place long before we have these events. That is a question that needs to be answered and not with BS. Yes. The fire is definitely making progress on its own. The firing operations currently taking place are having little to no impact on the advance of the main fire, which is taking place well to the southeast of the Coast Ridge fire lines. The fire is so far out ahead of the firing operations, in fact, that there is some danger (as mentioned by the FS today) of the fire making runs at segments of the line that have not yet been fired. Even if this happens, though, the odds are that firefighters will be able to contain any slop over (as they did with the slop over at the head of McWay). It’s frustrating to see a fire burn so many acres over such a long period of time, of course, but with a fire front stretching from Los Padres Dam nearly all the way to Lost Valley, the FS strategy of using aircraft to slow the fire, while firing off the containment lines as the fire approaches, seems pretty sensible. I haven’t heard a better suggestion. Mar asks: “How many acres do they want this to burn, before they put it out?” to which I answer: if the fire is stopped at the current primary containment lines (big box + Rodeo Flat Trail) it will have consumed approximately 220 square miles (140,800 acres) within the congressional boundaries of the Los Padres National Forest. If we then add the 37,194 acres in the Cal FIre DPA, the projected total comes to 177,994 acres, comparable to the size of the Marble Cone Fire. So far 63,234 acres of Forest land have burned. leaving 77,566 to go until the primary containment lines are reached. +1 to xt’s comment “with a fire front stretching from Los Padres Dam nearly all the way to Lost Valley, the FS strategy of using aircraft to slow the fire, while firing off the containment lines as the fire approaches, seems pretty sensible.” I haven’t heard a better suggestion, either. My big worry is that the fire may blow up and outrun the firing efforts. I am keeping my fingers crossed.